A successful business has happy and content employees. But this combination isn't always easy. While, you as the captain, can control your behavior and actions, how your employees engage with the company is a different story. To ensure they are putting 110% to their job, here are seven secrets to maintain a fun, casual office environment that is aimed at keeping employees happy and builds team success. Passion is the core for any productive office. Ask any successful company leader and the first thing you will hear about is passion for what they do. It's passion that drives them every day. So as a company, passion is important because it preserves excitement from one project to the next. Passion is a huge part in what makes an employee excited about the work they are doing and should be instilled in everyone -- from the leadership team, all the way down to each employee. To really get the benefits of a happy staff, companies should keep things positive and fun at work. Not everyone is going to be happy every day, but have you heard that old saying, "fake it till you make it?" Well, this applies to a positive attitude too. Once you and your employees get in the habit of making each day positive, you'll start to notice how little things no longer drag the whole team down and the spirit of the team is elevated. 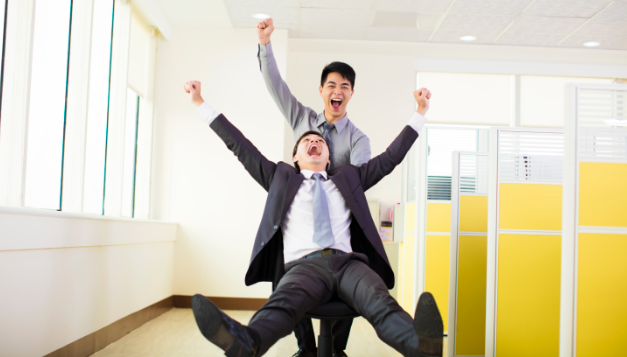 Offer employees praise on a regular basis when things are done correctly. When they aren't, offer constructive criticism in a positive way. Letting your employees know what they've done right (or wrong) helps them gain confidence in what they are doing. Confidence equals happy employees, happy employees equals higher productivity. Create an office space that is conducive to meetings and creativity. Allow several collaboration spaces with whiteboards, tables and chairs, so it's easy for people to work together. Different seating arrangements can be setup for different types of meetings to take place. For instance, walls with whiteboards for creative brainstorming and drawing, table with chairs for reviewing documents or a comfortable seating lounge can be used for more conversation and networking to take place. By offering a collaborative environment, you ensure employees keep working as a team. Put someone in charge of each project and have him or her designate the project tasks throughout the team. Each new project can be assigned a different team leader, so that everyone has the opportunity to be in the driver's seat. The purpose of designating leadership is to create a stronger sense of team by blurring the lines of boss and employee.